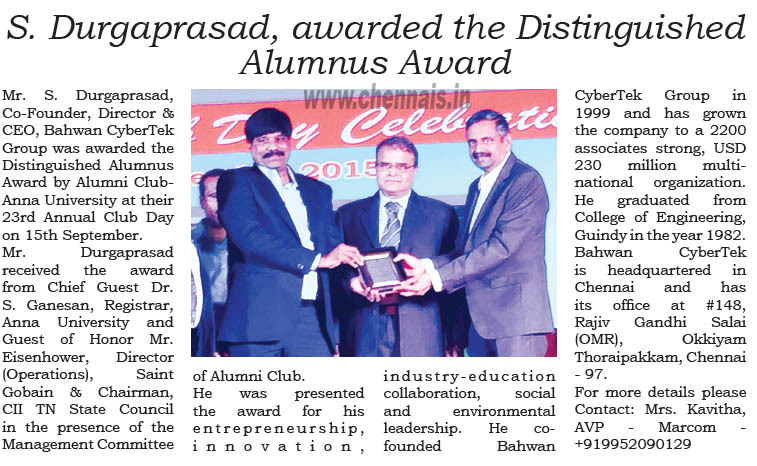 Mr. S. Durgaprasad, Co-Founder, Director & CEO, Bahwan CyberTek Group was awarded the Distinguished Alumnus Award by Alumni Club-Anna University at their 23rd Annual Club Day on 15th September. Mr. Durgaprasad received the award from Chief Guest Dr. S. Ganesan, Registrar, Anna University and Guest of Honor Mr. Eisenhower, Director (Operations), Saint Gobain & Chairman, CII TN State Council in the presence of the Management Committee of Alumni Club. He was presented the award for his entrepreneurship, innovation, industry-education collaboration, social and environmental leadership. He co-founded Bahwan CyberTek Group in 1999 and has grown the company to a 2200 associates strong, USD 230 million multi-national organization. He graduated from College of Engineering, Guindy in the year 1982. Bahwan CyberTek is headquartered in Chennai and has its office at #148, Rajiv Gandhi Salai (OMR), Okkiyam Thoraipakkam, Chennai – 97.